AlexanderPushkin is a Legacy Library. Legacy libraries are the personal libraries of famous readers, entered by LibraryThing members from the Legacy Libraries group. AlexanderPushkin is also an author. 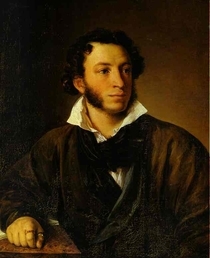 » See Alexander Pushkin's author page. About meAlexander Pushkin was a Russian poet and writer who lived from 1799 to 1837. He is considered Russia's greatest poet and an important figure in the Romantic movement. His most famous work is Eugene Onegin, a novel in verse for which he invented his own type of sonnet. Other famous works include The Queen of Spades and Boris Godunov. About my libraryPushkin's library catalog was printed in 1910 as "Biblioteka A.S. Pushkina," by B L Modzalevskii. A facsimile edition was reprinted in 1988.